Can Flaxseed Oil Upset My Stomach? 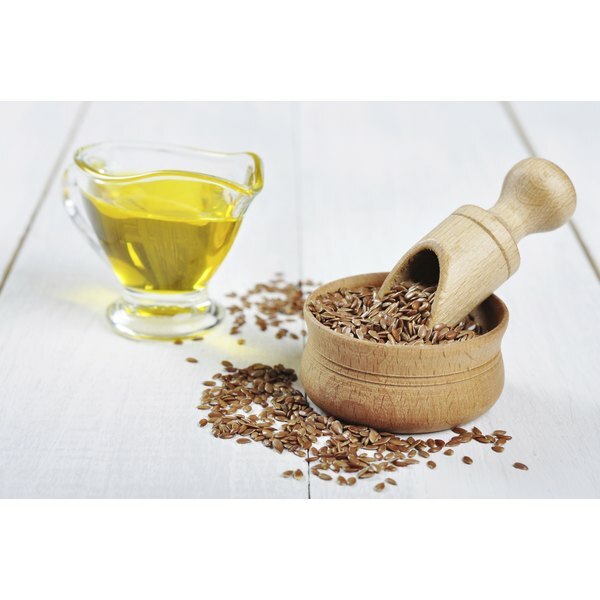 Can Flaxseed Oil Make Your Menstrual Period Late? Although flaxseed oil comes from flaxseed, the two do not always have the same benefits. Flax, a plant, produces seeds, and pressing the seeds produces flaxseed oil. Flaxseed oil does not contain the fibers that make up flaxseed. The flaxseed fibers contain the components that can affect the menstrual cycle. Since flaxseed oil does not contain the fibers, it will not delay or otherwise affect your menstrual cycle unless the manufacturer has added lignans to the supplement, which some manufacturers do, according to the University of California at Berkeley. Flaxseed contains plant fibers called lignans, weakly estrogenic substances also known as phytoestrogens. The pressed oil does not contain lignans. Flaxseed oil does contain essential omega-3 and omega-6 fatty acids, including the omega-3 fatty acid alpha-linolenic acid, or ALA. While ALA has health benefits as an omega-3 fatty acid, it has no direct hormonal effects that would change the menstrual cycle as the lignans in flaxseed might. Omega-3 fatty acids found in fish oil reduce inflammation but it's not clear whether ALA has the same effect. Alpha-linolenic acid converts to the omega-3 fatty acids in fish oil, DHA and EPA, but does so inefficiently, so that you don't get as much of the benefits touted for fish oil. Reducing inflammation should not delay the start of your menstrual because it has no effect on the hormones that control the menstrual cycle. Flaxseed, on the other hand, might delay the start of your menstrual period. In a University of Rochester study reported in the 1993 issue of the "Journal of Clinical Endocrinology and Metabolism," women taking flaxseed had a slightly longer luteal phase, the time between ovulation and the start of the next menstrual period. Since flaxseeds contain flaxseed oil, the best way to get both the potential estrogenic effects and the omega-3 fatty acid benefits is to sprinkle flaxseed on cereals or other foods. However, although flaxseed might help normalize your cycle by lengthening the time between ovulation and your next period, it won't prevent your menstrual period from starting. If your period is late, flaxseed oil is not the cause unless the brand you take contains added lignans. See your doctor if you experience delayed periods while taking flaxseed oil. Can Flaxseed Meal Cause Weight Loss?